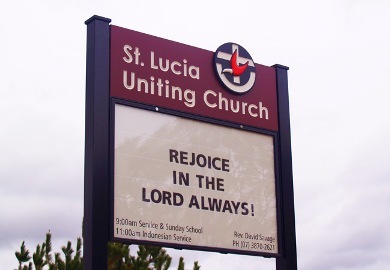 If you need professional assistance with your sign design, you can purchase one of our custom design packages. Your Danthonia sales representative will discuss certain aspects of the project with you so that a clear assignment can be drawn up for our design team. 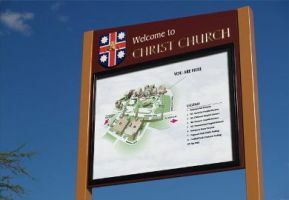 Below is an example of information compiled for the design of a specific church sign. Compare this assignment with the resulting design sketch and a photo of the completed sign. Hanging system? Client to supply and install posts. 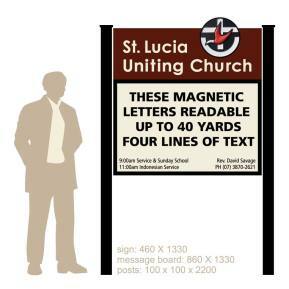 This is the sign the client suggested as an inspiration. Find a sign on this site that might be a starting point for your design. This is the design drawing which our designers sent back to the client for approval, prior to fabrication of the sign. Below is a photo of the completed sign that was emailed to client prior to shipment.